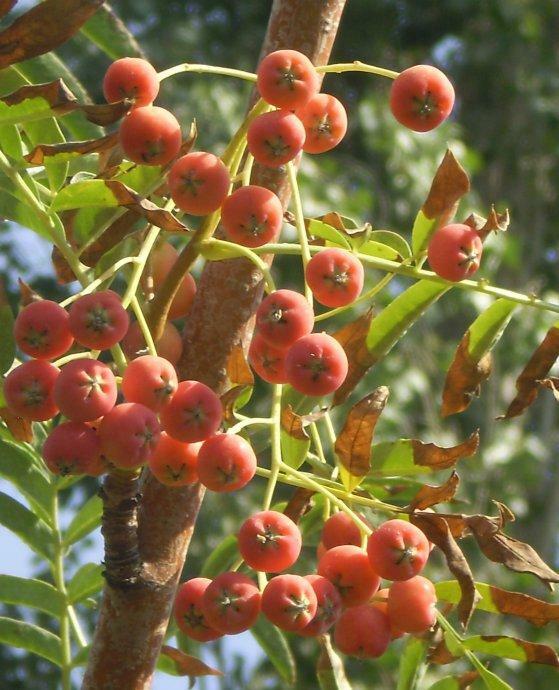 The drug is the bright branch, stem bark or ripe fruit of Sorbus tianschanica Rupr. (Family Rosaceae), growing in valleys or edge of conifer woods, distributed in Gansu, Qinghai and Xinjiang of China. The branch and stem bark contain hyperin. Fruit contains vitamin A, C, E, cartotene, parasorbin acid and glucoside. Leaves contain cholorogenic acid, isocholorogenic acid, catechin, epicatechin, rutin and glucoside of naringenin. Lung, spleen and stomach meridians entered. The branch and stem bark are used as antitussive, for the treatment of pulmonary tuberculosis, stomache, cough with lung-heat, gastritis and Vitamin A, C, E deficiency. Decoct 30~60 g of the fruit, or 9~15 g of the twig.